First of all, I wish to make one thing very clear. I DO NOT endorse, desire, nor support illegal activity. I wish that people would abide by copyright laws and respect the legal protections of others. With that in mind, I must also state that I am even more against any branch of government or any other organization repressing, impeding or violating the rights of the individual. I consider these rights sacred, divine and protected by the highest law of the land. I consider myself blessed and fortunate to live in “the land of the free” and feel any breach of the rights of an individual’s rights is a tragic wrong. 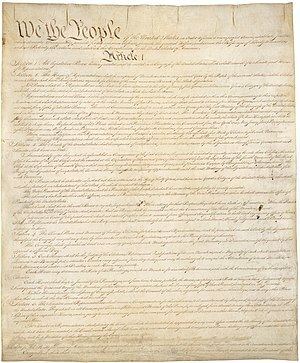 The Constitution of The United States of America is a beautiful document. It was and is the greatest piece of legislation to ever become actual law. The men who crafted it were bold visionaries who felt the rights of the common man were to be held sacred. So strongly did they feel this, that they risked all to bring that vision to reality. The Constitution was carefully and laboriously crafted to assure a balance of powers in the new government. The authors’ main concern was to assure that the rights of every individual American were adequately protected. They feared a government which could suppress the rights of an individual. The goal was to create a government “of the people”. The radical thought was that a ruling body was to serve the people of it’s nation and not the other way around. It was much debated, drafted and revised and, in fact, did not take effect until 1789. In other words, it took some 13 years after America’s succession from the king to finally agree on exactly how to protect the rights of the individual. This fact alone should show just how serious that matter was to our Founding Fathers. Despite all their effort in revision it survived not 3 years without a demand for modification from the States. This means that I, as an individual, have a right to privacy. It means that the police, government or any one else, for any reason whatsoever, can NOT search your house and/or seizing your property without first producing some evidence that I am doing something wrong. This would not allow a law enforcement agency, for example, to decide it would be a good law enforcement tactic to search every house in a certain city. It means that one must first have evidence that there is a cause to search. Is this basically not what is happening? The RIAA/MPAA is currently crawling the web and checking every server and even home PC’s. They have no need to produce any suspicion. They methodically check every connection. Now I know this is a radical leap but how is that any different from saying “All server hosts are pirates, until we (the RIAA/MPAA) judge otherwise.” ? This seems no more ethical than spam crawlers which hunt down e-mail addresses on the web and then flood your in box with junk. Now, I do agree that peer to peer networking has created a whole new world of copyright violations and something must be done about it. However, I have fundamental problems with this tactic and see it as a violation of my individual rights. What reason do they have to search EVERY server? They have clearly crossed the line between attempting to uphold the law and hunting witches. And, by the way, all servers host witches. Worse yet, they are not a law enforcement agency. They represent private business interest. This is why, to the best of my ability, I will block the RIAA/MPAA from my teeny corner of cyberspace. I am not a pirate. Until you have some evidence to show just cause, please spend your time removing SPAM from your inbox. Until then I shall continue to exercise my first amendment right and lunatically rant about your, in my opinion, illegal activity.